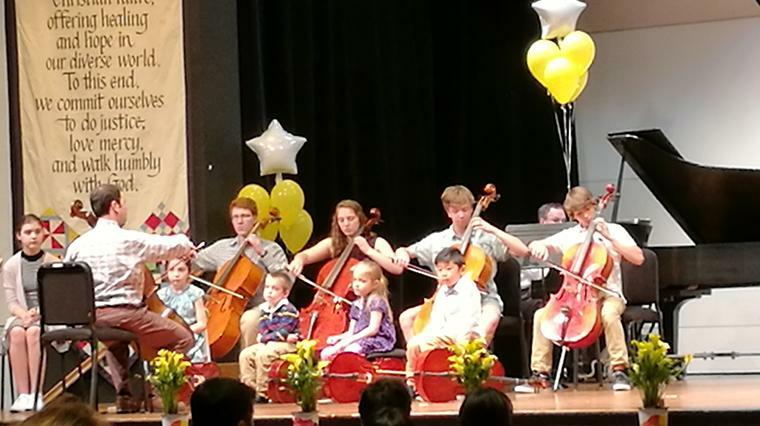 Instrumental music instruction: violin, viola, cello, double bass, piano, flute, guitar; Suzuki violin, viola, cello, piano, and flute. Musikgarten: ages infant to 7 years. Call 540-432-4277 or email prepmusic@emu.edu for information about class openings. For more information contact prepmusic@emu.edu. Chamber Music Camp will be June 24-27, 2019. This camp is for string players of all levels and ages who can read music. Participants will play a variety of music (from Classical to Texas Swing) in large and small ensembles. 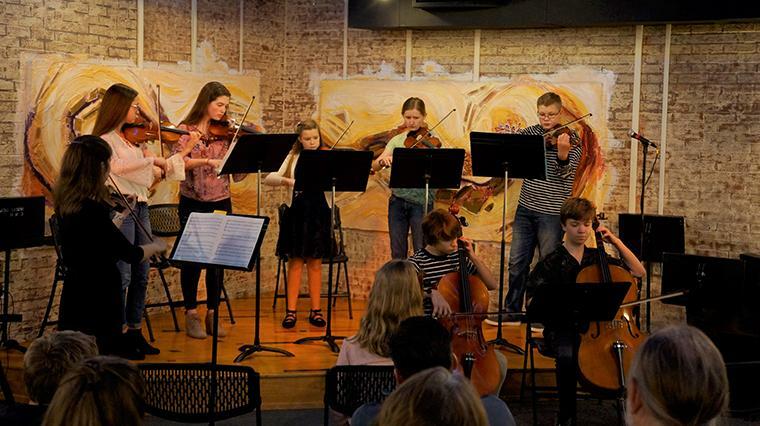 Our camp combines music-making fun with community engagement: chamber groups will have the opportunity to perform at both the Harrisonburg Farmer’s Market and the Virginia Mennonite Retirement Community. The Violin Camp will be June 24-27, in the morning. This camp is for students in Suzuki Book 1 or early Book 2 (all ages), as well as for Beginners (ages 3-6) who want to experience violin for the first time. 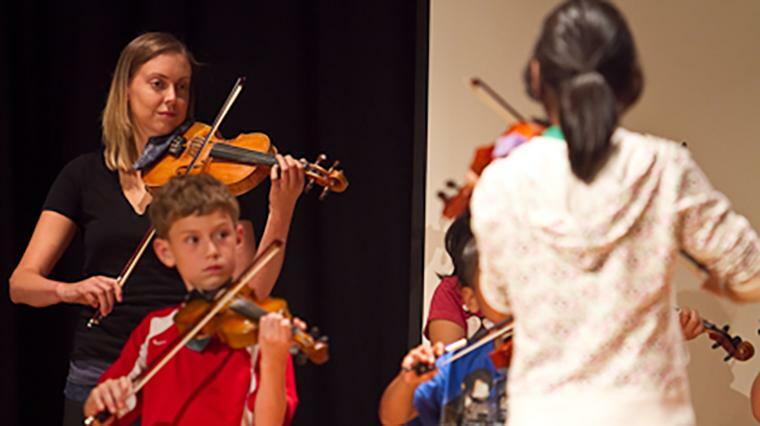 Each day participants will play violin in a variety of group activities, masterclasses (mini-lessons), and Musikgarten classes designed to engage students in a variety of musical concepts. Musikgarten Camp at EMU provides opportunities for children to build confidence in musical expression and lays a foundation for future music learning. Through a combination of songs, movement games, instruments, storytelling and listening, children are exposed to a wonderful musical experience! Classes will be held June 24-27, in the morning & early afternoon. Class offerings will be Music for Babies, Music for Toddlers, Cycle of Seasons, and Music Makers. Please contact the Preparatory Music Office for up-to-date information on openings for instrumental lessons, Musikgarten classes, and Youth Symphony. 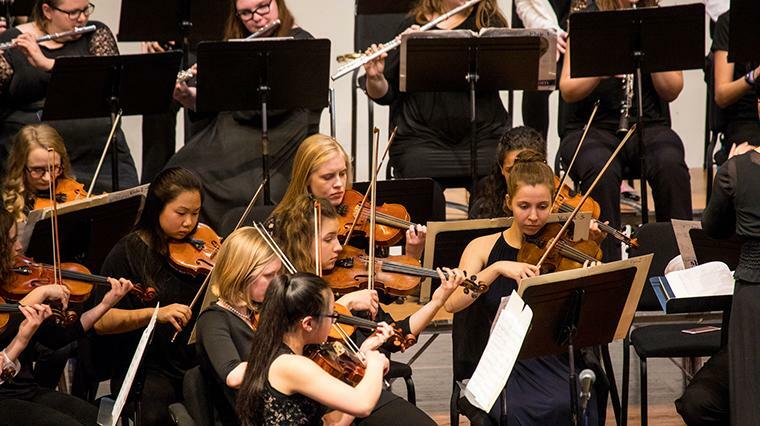 Believing music can enrich everyone’s life and is to be shared, performances are arranged in formal and informal settings on EMU’s campus and throughout the community to provide quality music education to the residents of the greater central Shenandoah Valley area. Participants come from as far north and east as Woodstock and Luray and from as far south as Waynesboro and Lexington. Students also travel from West Virginia. Classes held May 14, 21, 28. Register online by May 3. Interested in learning more about music lessons at EMU? Contact the preparatory music program offices at 540-432-4277 or prepmusic@emu.edu. We’d love to hear from you! The EMU music program offices, both preparatory music and the undergraduate academic program, are located on the lower level of Lehman Auditorium. On the main floor of Lehman you’ll find a mainstage auditorium that houses performances, weekly chapel, university events, and more. On the lower level you’ll find the music program offices (through the glass double doors), faculty offices, a recital hall, individual practice rooms, and more.